Considering the US through the prism of stories in the Bahamian press reveals facets of the flawed, cracking diamond that is our country. A day later The Tribune reported ‘Van donated to youth soccer organisation’. The same two Americans marked ‘the delivery of a 15-passenger van to Youth Empowerment through Soccer International in the Bahamas’ whose mission includes teaching players to ‘say no to drugs and crime’. Lisa Johnson, the official US embassy site lists as Chargè d’Affaires a.i. [ad interim]. Johnson’s prior post, according to the embassy: Director of the Office of Africa and the Middle East in the State Department’s Bureau of International Narcotics and Law Enforcement Affairs. The US hasn’t posted an ambassador to the Bahamas since November 2011. We’ve not had one for 6 ½ of the past 12 years. That gages how seriously we’re taking our closest island neighbor which, as I’ve written, has had some unpleasant economic consequences for the US. Far more importantly, The Bahamas are the salient of the greatest incursion into the lands and waters covered by the Monroe Doctrine in its 192 year history. Without a gunboat in sight, the Peoples Republic of China arrived on our doorstep and made themselves a vacation condo whilst building an economic redoubt – with $3.5 billion for Baha Mar and $1.4 billion for the British Colonial Hilton visible. The tourist-brochure pictures of The Bahamas in one regard never lie: the sun shines here. So, why are solar arrays are less common than strip mall ‘web shops’, betting parlours offering ‘poker, casino-style games and sports betting, in addition to a numbers lottery’? In two weeks, we’ve spotted one roof-top panel – not array. As for web shops…. Despite increased demand from new development, brown and black outs and managerial mayhem, Bahamas Electricity Corp. (BEC), the government-owned utility, have kept alternative energy all but illegal. The Government recently withdrew (with a lame explanation) a request for proposals for commercial solar installations. It had elicited proposals well in excess of what the government had sought. Meanwhile, BEC has stymied domestic arrays with proposals for ludicrously burdensome inspections and metering fees. The sun keeps shining, and BEC’s diesel and heavy fuel oil generators keep firing, while it applies the lessons of American utilities’ resistance to solar. Meanwhile, The Bahamas have a gambling problem. As in Massachusetts and many other states, the government of The Bahamas doubled down on its bet on destination resorts anchored by casinos with Baha Mar as the cure for the country’s economic woes. 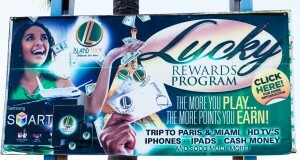 But Bahamians have at least as great a taste for gambling as tourists and a burgeoning sector to service them. And, there’s the rub. This winter the government pushed through a Gaming Act to deal with the facts on the ground. But the facts are changing fast. On April 2 a front page Tribune article headlined, ‘Island Luck may have no licence – but it’s opened a new web shop’. It was the most prominent of four highly positive stories graced by six pictures. In describing Island Luck’s new venue, CEO Sebas Bastian (a remarkably handsome, youthful and carefully groomed man whose well-tailored suit topped with a Bahamas flag lapel pin makes him look more like a prime minister than the PM) sounded like a Baha Mar executive describing the resort’s mega-casino. We’re seeking to change the standard of web shops and bring it in tune with the international type of atmosphere we’ve gotten accustomed to when we travel…. So web shops have become social environments, and what better way to accompany that social environment than offering a great, comfortable, safe, modern facility for our patrons…. 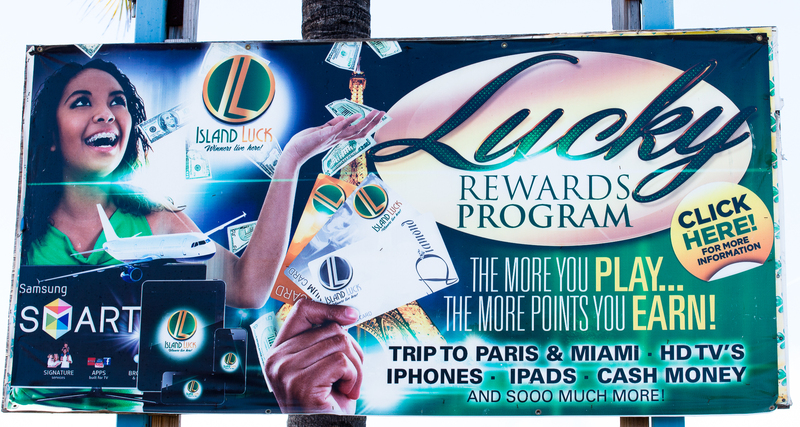 The new shop – the first of four Island Luck will open this month – ‘boasts a new component, a drive-through window where patrons can purchase “numbers” or make deposits to their accounts without having to leave their vehicle.’ The Nassau Guardian reported it has ‘50 slot machines, a bar and a sports lounge’ in what is ‘a small scale casino’. Behold! The future. If that seems extreme, see the New York Times for March 31 on what’s happening in America’s bellwether state: ‘A Texas ban on gambling that doesn’t quite work’. On April 7, The Guardian published three and a half pages of legal notices from the Gaming Board for the Bahamas of nine applications for a ‘gaming house operator’s license’. For New Providence (Nassau) with a population of 250,000, the applicants listed 134 Island Luck-type locations.. That scale seems ludicrous until you see the empty parking areas crossed by a stream of pedestrians visiting the shops from nearby homes. A day later, the Guardian’s business section’s front page headlined, ‘Webshops expand to be “too big to fail”’, quoting the ruling party’s deputy leader, MP K. Peter Turnquest who saw the new venues as a means to force Gaming Board approval of the license applications. Two Bahamian entrepreneurs yesterday received a $25,000 grant to start their own businesses courtesy of a self-start funding programme from the country’s largest web shop operator. The names of the businesses caught my attention, as they must have Bastian’s publicists. Of particular concern are the very public programmes sponsored by the industry that seem designed to influence the general public sentiment as a way to pressure government for a favourable result, and the involvement of children through donations to schools as part of that campaign. ‘U.S. Embassy gives cops new boat’, Punch, Mar. 30, 2015, p. 30. Although some of its stories are screamingly funny, it is not the Bahamian equivalent of The Onion. ‘Van donated to youth soccer organisation’, Tribune (Nassau, BS), Mar. 31, 2015, p. 3A. It helps in interpreting these stories to know that the Tribune generally alines with the opposition, Popular Labour Party (PLP) whilst the Nassau Guardian alines with the ruling Free National Movement (FNM). The Punch is inclined toward the PLP but seems fairly even-handed in its exposés. Johnson has a most impressive biography, and if the US were appointing career foreign service officers as ambassadors, she would seem a very good candidate – the drug focus apart. Nicki Kelly, ‘Baha Mar construction row could sour China relations’, The Punch (Nassau, Bahamas), April 2, 2015, p. 16 (behind pay wall). Kelly puts vassaldom in the future. Neal Hartnell, ‘Solar Bids: Offers for 50% greater supply already in’, Tribune, April 2, 2015, p. 1B. Neil Hartnell, ‘Gov’t urged: “set higher goals” for renewable energy’, Tribune, April 2, 2015, pp. 1B, 7B. Nico Scavella, ‘Island Luck may have no licence – but it’s opened a new web shop’, Tribune, April 2, 2015, p. 1A. Royston Jones Jr., ‘Island Luck opens new store despite no web shop licence’, Nassau Guardian, April 2, 2015, p. A6. Nassau Guardian, April 7, 2015, pp. 11A-14A. All comments were due by 5 p.m., April 10. It’s worth noting that until recently in the US paid placement of legal notices was a political plum handed out by parties controlling the executive branch to friendly newspapers. Id. This is my sum. That number does not include ‘gaming house agents’ which presumably would offer something like video poker or numbers tickets. Natario McKenzie, ‘Webshops expand to be “too big to fail”’, Nassau Guardian, April 8, 2015, p. 1B. Nico Scavella, ‘Entrepreneurs handed grants thanks to Island Luck scheme’, Tribune, April 2, 2015, p. 7A. OWN is not an acronym. It is a subsidiary of the Island Luck Cares charity. McKenzie, op. cit., p. 4B. Scavella, ‘Entrepreneurs handed’, op. cit.